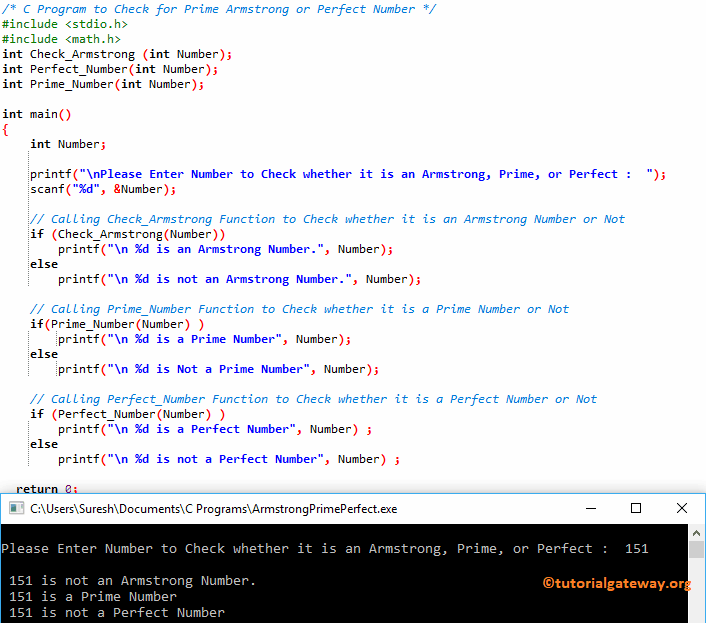 In this article, we will show you, How to write a C Program to Check for Prime Armstrong or Perfect Number with an example. We already explained the concept of Prime, Armstrong or Perfect Number in our previous articles. So I suggest you to refer C Program for Armstrong Number, C Program to find Perfect Number and C program to find Prime Number articles to understand the code. This C program to check prime, Armstrong or perfect number allows the user to enter the Size and the row elements of One Dimensional Array. Next, we are created an individual function to find whether it is a Prime Number, Armstrong Number, or Perfect Number.